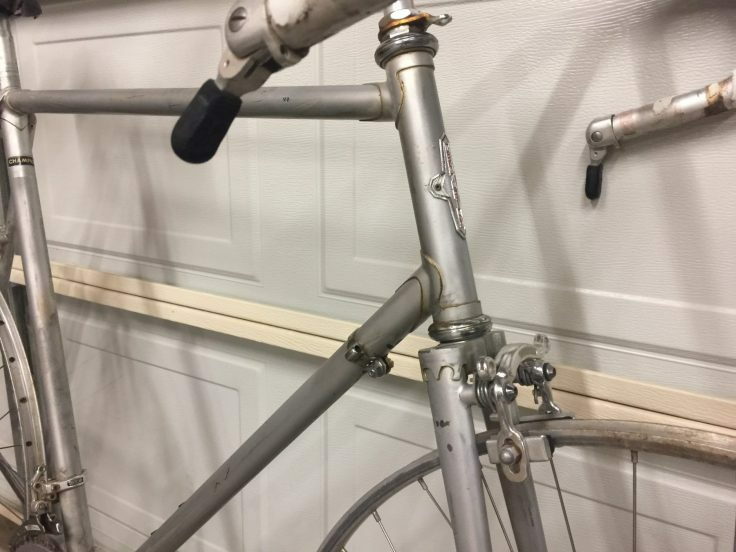 The Gugificazione treatment to my Miyata 912 fork included posts for a Gran Compe 610 brake, giving mounting locations for the front rack as well as maintaining fender clearance after the re-rake. I’ve got KoolStop Cross full-salmon pads (still using road pad holders in this photo) and love the braking feel and modulation. They squeal only once in a while at high speeds, but definitely not an issue. I also tried a MAFAC Racer with the Compass upgrades and salmon pads on the same posts, but didn’t notice any improvement in power or feel, and the squeal was nearly constant. So GC stayed, and its as nice a brake as the dual pivot that was there before the mods. 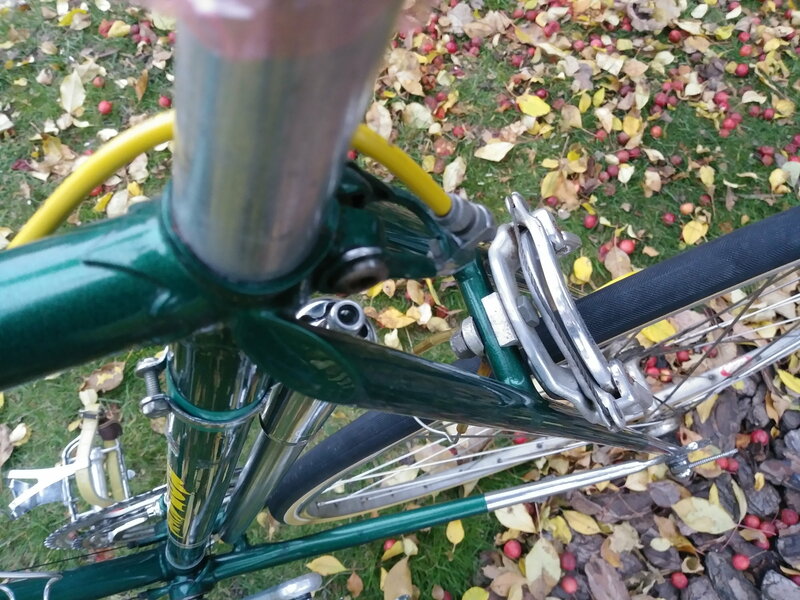 BTW, a sweet addition was the roller straddle cable carrier with quick release. Anybody want to buy a single Racer set with the upgrades, spare pads, and some polish work accomplished? Last edited by Dfrost; 12-04-18 at 03:25 PM. Gran Compe is the fancy version of Dia Compe. Like Lincoln instead of Ford. They are simply the deluxe version with better finish and some upgraded bits and pieces -- for the most part. The short reach Gran Compe 450 center pulls were Gran Compe only. For that matter all but the GC 450 were license built versions of Weinmann CP brakes. 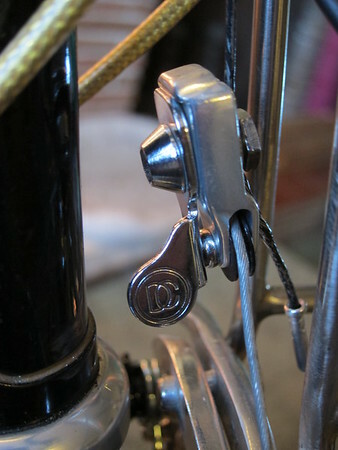 As someone noted, even the Weinmann labeled brakes were made in various places. I'm not sure if "G-Type" was an earlier version of Gran Compe, or if it meant braze on. A bit before my time. Anyone know? I dig that frame, and have been keeping my eye open for one for a while... I hope your restoration goes perfectly.. Sort of OT question: What is the difference between Weinmann 610 and Weinmann 610 Vainquer 999? I am no expert, but I can say that the “610” refers to the caliper length. The Vainqueur is the actual model number. The Weinmann Vainqueur models marked 725 have a longer reach. They were commonly sold in sets with the 610 on the front and the 725 on the rear. First, I think the long one is a 750, not a 725. Second, I think 999 referred to a pair of calipers where you get the 610 and the 750. Interesting serrated marking at the pivot fastener -decorative? I'm a fan of the old MAFAC Racer with its shoe mount slot in plane with the arm. The post assembly may weigh more but adjustability for toe is easy peasy. Soon to use the GB Coureur 66 on another build. Note the casting wrapped around the arm pivots. Thanks! i really dig these old Pro Tours. 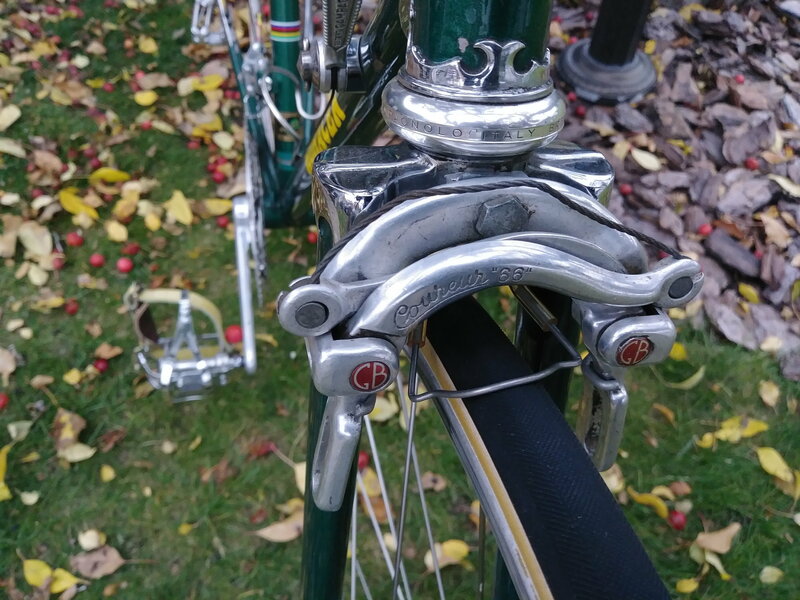 Those were some of the coolest centerpull brakes ever. They made them in black too, BTW -- since we are discussing vintage black parts in another thread. I still remember a Zeus came into the shop where I worked with the complete black Zeus 2000 group including those brakes. Never saw another set like it. It seemed impossibly cool and exotic at the time. It's hard to see from a photo how delicate and graceful they are in person. Last edited by Salamandrine; 12-06-18 at 02:40 PM. I put some Tourneys on my recently rebuilt 510 to help maximize fender clearance. They've got a lower profile than Weinmann/Dia Compe, but seem a bit flexy when I test them in the stand. They stop really quick, though, very easy to lock up. 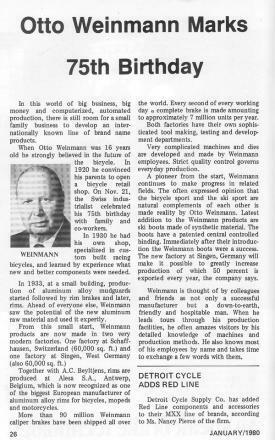 Interesting read from 1990 about Otto Weinmann. Those GB brakes have always intrigued me. Any comments on how they compare to their contemporary brakes?? Also.. what's the story on that frame? Any frame with chromed Nervex lugs gets my attention. This project is bit down the que. Custom Paramount. I originally acquired the GB Couriers for an English Witcomb though unfortunately that bike requires a very short reach. These are the shortest reach model and still don't fit, so l decided to use them on this Paramount. Have yet to experience them but like the design. Someday you'll have to publish your list of projects... seems to be a lot of them, and all of them are fun and interesting! Because I spend to much time wondering about stuff that probably doesn't matter, I have to wonder how the GB design avoids having excess play in the pivot. Of course, I am amazed that the humble Weinmann centerpull doesn't have any adjustment for the pivot, but rarely has any noticeable play. In comparison, every single pivot sidepull brake has provisions to adjust the pivot tightness ... although I don't recall how the Campy monoplanar brake handles it. ..sorry... too much rambling and such.... but would be interested in any sort of study of the effects of brake pivot play and the effect on brake effectiveness. Surely Frank Berto or Jobst did some testing at one point or another?? Pretty sure you can adjust the pivot tightness on the Weinmanns. I'm up for the study. Always nice to have more information. 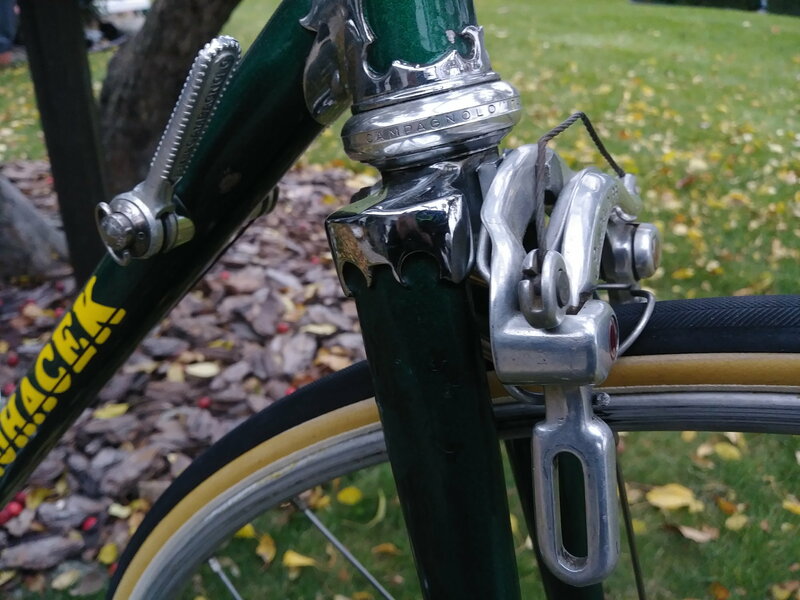 The only "adjustment" would be to simply tighten the pivot bolts, but which tends to "mushroom" the ends of the sleeve and have one end dig into the alloy bridge. Once any binding is detected, there is no reversing it, short of disassembly and thinning the bushing flanges. If you loosen the bolts slightly they will tend to loosen unless a penetrating grade of Loctite is applied to the tip of the bolts at the hex nuts. The pivots will then exhibit some added play and flexibility. Instead of trying to make a shorter straddle cable, you can get the same effect with a wider yoke. I like to use the triangular yokes used for cantis. I don't see how freeplay can have any effect once the actuating cable tension is applied. With the pad pushing against the rim, any freeplay is fully preloaded by static force that it can't "rebound" to cause any movement. What changes with increased freeplay is that the pad can initially tilt in response to the initial meeting of the pads to the rim. So the retracted state of the pad's toe adjustment might need to be adjusted so as to take the freeplay into consideration. I always study the pad's positioning along the rim's brake track with the brake applied and with the rim having been driven forward slightly under some force of braking, so that the pad can be adjusted to meet the rim forcefully still in perfect alignment along the brake track. 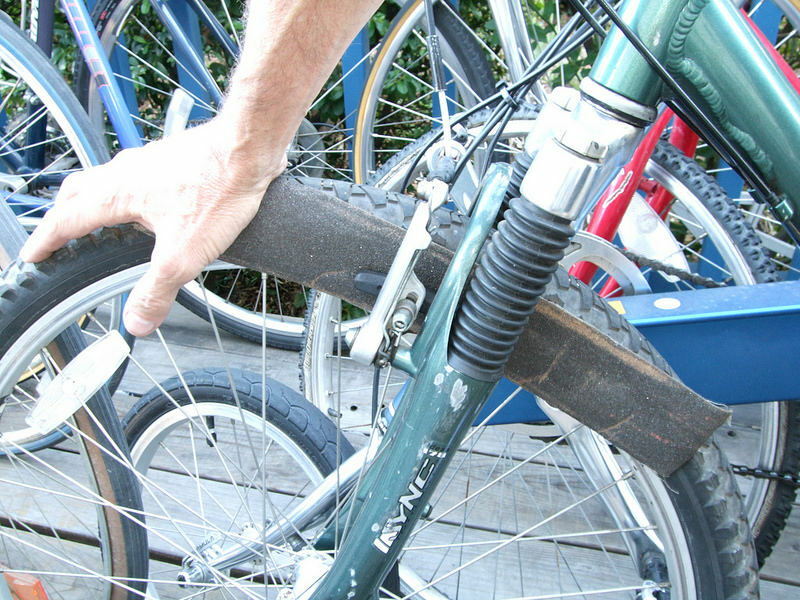 This can keep the pad from cutting the tire. I was thinking of brake squealing. 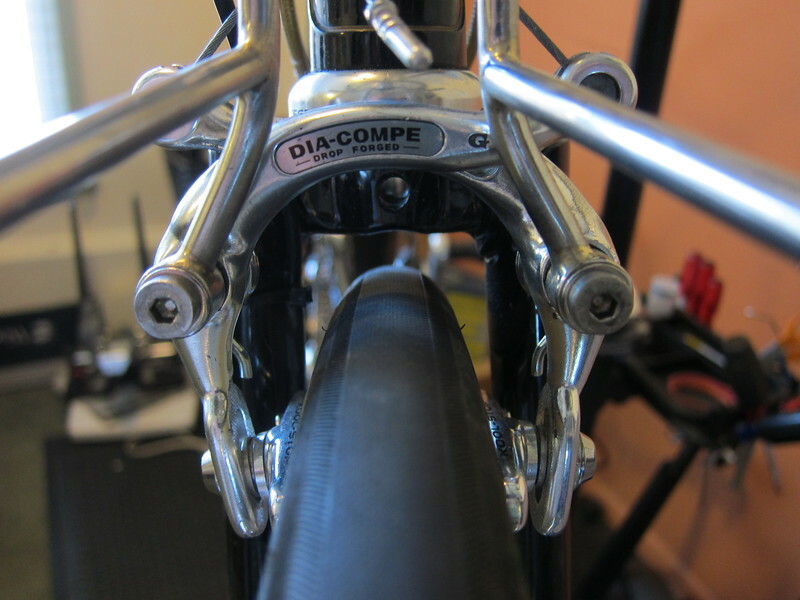 I've had times with Campy side pull brakes where squealing was reduced by adjusting the pivot to get rid of any play. Yes, but I think that tighter pivots might only be affecting the dynamic toe of the pads (the effective toe as the pad begins exerting real force against the rotating rim). In other words, tight pivots better preserve the static (visible) toe-in of the pads, instead of losing some of the toe-in to the freeplay of a loose pivot. I don't think that a squeeling brake is causing any jiggling movement at the pivots, even as the pad surfaces are "jumping around" against the rim. 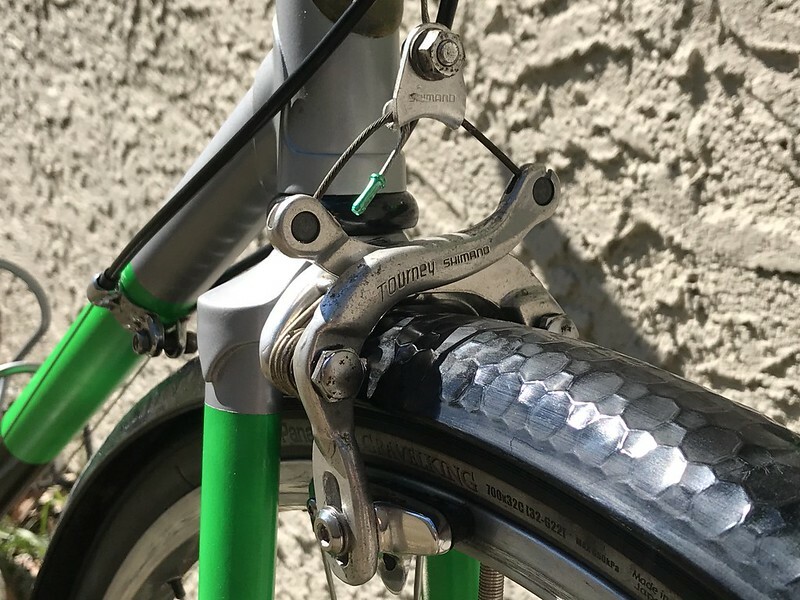 It takes positive toe in the static adjustment to effect zero dynamic toe under braking loads, due to freeplay in the pivots and flex in the arms and pads. I often set pads to zero dynamic toe by rotating the wheel in the forward direction with sandpaper pulled against the pad surface with brake applied. This would seem to compensate for any of the effects of pivot freeplay on the dynamic toe of the pad against the rim under the force of braking.